We often get asked why we bother taking our child , who is not even 2 years old out of the country. They wouldn't know better, and it is definitely a hassle to pack and manage a hyper kid on board the plane. True to all that, and we had first hand experience of J disturbing other passengers on board the plane when we flew to Hong Kong earlier this year. However, that did not hinder us from wanting to travel with J again, not even when he is displaying signs of the Terrible Twos. Travelling with the child is a different experience. For us, it is an opportunity to spend quality time as a family. It is important especially when we are always so busy during the week, and when there's always distractions such as housework and the likes on a normal day. So, the trip allowed us to bask in one another's company, and spend our time doing silly things, snuggle in bed or just chat like we never chat before. We did exactly that last week. I was attracted to how different it felt to be in Penang when I was there for work months back, quite unlike the other states in the country. So, we decided on the food capital of Malaysia for this short getaway. The flight with AirAsia was uneventful. J was exhausted, and very quickly fell asleep after the plane took off. We booked to stay at Holiday Inn Resort Penang, along Batu Ferringhi so we can get quick access to the beach and have most amenities at our door step. Recently renovated in 2010, the resort comprises of the beach wing and the Ferringhi tower just across the road that's joined by a link bridge. One of the more pocket friendly options along the beach that caters to needs of family with young children. 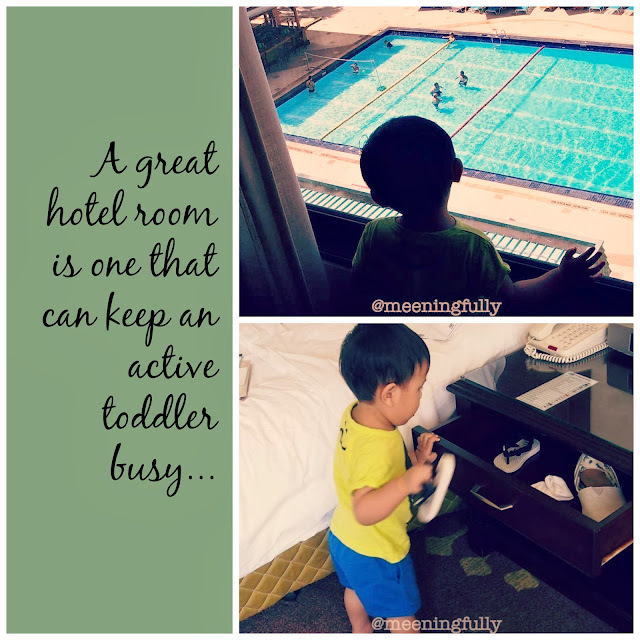 I loved how they have kids suites available, and that kids eat for free at the resort. Something I believe most families will appreciate. Complimentary fruit platter in the room. More than enough fruits for the family, and best of all, J has the whole bunch of bananas to himself. Our room was at the Beach Wing facing the sea. Great view and we had all the facilities where we were as compared to staying at the tower wing. While some parts of the room seemed old, and in need of repairs, it was very clean. Room is large enough for J to run around in and he was happy pacing up and down keeping himself busy. J enjoyed watching people at the pool from our room window. At the same time, with no lack of cabinets and drawers in the room, he had fun hiding things in them. Good, innocent fun. Nice touch! Putting a name to the housekeeper. Room aside, what I found lacking at this hotel is the dining options as well as the boring looking pool as compared to its neighbours such as The Golden Sands Shangri-La Resort and The Hard Rock Penang. The property only has one restaurant and the food served leaves much to be desired. As someone who often look forward to hotel breakfasts, I only had toasts on both mornings. Says a lot I guess. View of the beach wing from the beach. The other thing that this hotel lacks is a proper spa. However, that is compensated by a massage hut by the beach. We had afternoon tea at the Terrace Cafe, which turned out to be a disappointment. Service at the Holiday Inn compensated for the disappointment in the food areas. Loved how everyone we met were friendly and hospitable. So, if you are cost conscious and happy to seek alternative dining arrangement, the Holiday Inn Resort is definitely one you should consider when visiting Penang. Have you been to Penang? If year, where did you put up at? Stay tuned for Part 2 of my Penang trip, coming up in the next week!